This post is intended to make it as Simple as Pi to get up and running and make your Raspberry Pi control some lights and small motors and to respond to switches and sensors. Minimum Requirements – a Raspberry Pi with Raspbian installed (a working internet connection is very handy but not required) a breadboard, some Light Emitting Diodes (LEDs), some resistors and some wire connectors. Total cost £5-£10. Blue italics are extra information for those who like to understand things a bit more – Pink italics are for the more advanced users and can be completely ignored by normal users. Your Raspberry Pi needs to be connected to the internet to install the software but not needed to run ScratchGPIO. Copy the text below ( left click just before the s of sudo and drag right until all the text in the line as been selected) then right-click and select copy. Open up an LX Terminal window and select Edit and the Paste that into an LX Terminal window and run it to download the installer. 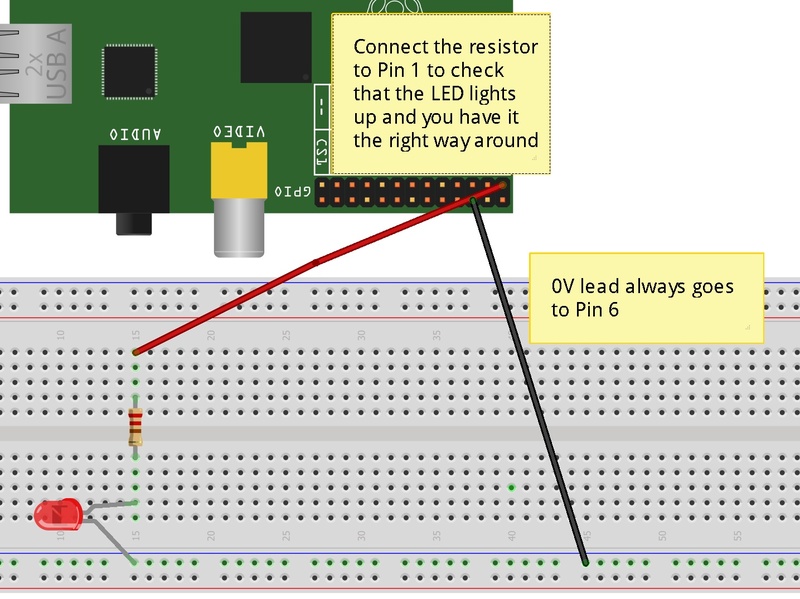 AT A MINIMUM – get a breadboard and use some female-male 0.1 leads (available from lots of on-line suppliers or your local Maplin shop) Check out GPIO pin guides to make sure you know what pins are what. Wire up Pin 1 (3.3V) to (at least) a 330ohm resistor – connect that resistor to the long lead of an LED and then connect other end of LED to Pin 6 (0V). It should light up. If it doesn’t try reversing your LED. Now move the lead from Pin 1 to Pin 11. Using ScratchGPIO Run the special Scratch icon (Scratch GPIO) on your desktop. (It is actually a completely normal version of Scratch, it just runs a little Python background program as well that handles communications between Scratch and the GPIO and automatically enables Scratch’s Remote Sensor Connections(RSC)) To test out control from Scratch, click on File then Open and then click on the My Projects button and select blink11 and click on OK. Once the project opens, just click on the OK to enable Remote Sensor Connections. To run the script just click on the Green Flag. Your LED should now blink on for 1 second and off for 2 seconds – see trouble shooting if this doesn’t happen. As you can see in the blink11 script , you can simply use a broadcast message telling Pins to go on or off (Up to 3.3V and down to 0V) The valid messages are along with the corresponding pin off messages. You can also say And you can replace the word on with high and replace off with low if you want to talk in pure logic levels. Alternatively you can use the pinpattern broadcast to achieve the same result e.g: This will also set just pins 11 and 13 on. Inputs To check an input, you should go into the Sensing block and click on the word “slider” at the bottom and you’ll notice that you have pins 22,7,3,5,24,26,19,21,23,8 and 10. If you connect a switch to one of these pins (through a resistor don’t forget) to OV, then you can detect when the switch is open or closed. The inputs will normally read 1 and go to 0 when they are connected (through a resistor) to ground. Click on the checkbox next to pin7 and try it out. For more advanced Scratchers, you can use variables instead (or as well as broadcast messages) . For example: create a global variable called pin11 To make pin11 go on or off use On can be replaced with high or 1 and off can be replaced with low or 0 so that you can use whatever logic scheme you’d like. Note – currently there is an unfortunate “bug” in Scratch in that it remembers variable states and only sends changes out. Even when you press the Green Flag, it will not send the state of all the variables out, it will only send them when a variable changes. I recommend (nay insist even!) setting any gpio variables to an invalid value – say a full-stop and then to their initial state in a Green Flag start-up script. Need more Pins as outputs? If you need more than 6 pins to be outputs then, for example, you can use broadcast pin7on and pin7 will change from an input to an output. If this doesn’t give an error but doesn’t make a LED on Pin 11 blink then we have real problems Houston 🙁 Try connecting the lead going to Pin 11 back to Pin 1 to make sure the LED lights up then just in case you have a loose connection. Thanks Simon, you have been working hard – I’ll test this on a ‘clean’ card. Nice documentation. Can’t wait to try the new version. set pinpattern is this confused documentation or me being thick? Anyway it does not work on my new install. Everything else seems fine, no response from pinpattern. Aah – yes – 🙂 I forgot I removed it and I haven’t put it back yet! I’ll get onto it 🙂 But what do you mean about it not initilising – if you mean using variables – note the Scratch “bug” in that it won’t re-send a variable value if it hasn’t changed – even on a Green Flag event 🙁 Thats why you have to use dummy values, wait a bit and then set initial values in Green Flag startup code..
Running the new install fails to copy the above file, no sign of it! I’ve tried a number of times – same result – what am I doing wrong? My reply appears to have vanished – new upload works OK. Going to work on Analogue sensors now. Thanks for this wonderful work. I started to use it to automate an old train circuit for my grand sons. Unfortunately I need more output pins (for traffic lights and points) and less input pins; is it possible to change usage of specific pins ? I am not familiar with the broadcast method as I am using variables which work perfectly but I will try it. The first elements of my application using output pins are working. No bug in that part. I will check input pins next week. Herve – I would love to see more details on your train setup as I have though about doing the same! Thanks. That part now works..
although I just realized that I still have the problem with the pi just freezing soon after it plays the sound :(. Can you post a link to a script that is causing these issues please? I dont really have a script. Its just a scratch project connected to input buttons via GPIO pins. I am running the version of ScratchGPIO2 from this website. Thanks much. Scratch is still very unstable on the pi. Just clicking on the Sounds tab on the project seems to cause the CPU to spike to over 80% and immediately drops down when I click out of it (i.e. when I go to the scripts tab). Playing sound a couple times makes the host die. Anyone else running into this problem? Yes – I did remove sound.conf. Things appeared to work fine for small wav files but raspbian continues to crash for larger files. Occidentalis does appear to be stable in comparison so far. But occidentals sound like its ancient (:) ) so you are just being lucky 🙂 We need to find out cause of crashes on latest Raspbian so everyone can benefit 🙂 Can you upload a sound file that crashes on yoru updated Raspbian setup? I need 4 input pins connected to buttons for my project – I see that pins 22 and 7 work perfectly but pins 3, and 5 always seem to be in an “on” state. Any reason why those two behave differently? Is there a simple way to turn one of the output pins (say 16 or 18) into input pins? Thanks very much for your program! Yes – Pins 3 and 5 have pull-up resistors conencted to them on board the RPi so they will naturally read high unless connected to ground. Only 11,12,13,15,16 and 18 are defaulted to ouputs – all the rest are inputs so you can choose your other two from 24,26,19,21,23,8 and 10. It’s not working for me in Scratch, although if I follow the troubleshooting instructions the LED does blink without error. What should I check next to get scratch working? Thanks. Do you intend to have a version of Scratch GPIO using the new version V2.0 of Scratch which has been released a few days ago ? Scratch 2.0 has no way of connecting with other progs 🙁 We will have to wait until the summer for a version that might. I am very new at this, and I cannot get past the first step. Do you know what I need to do to get it working? Never mind. I’m all set. I was able to copy the file to the desktop and run it from there. Can you tell me if there is any chance to simulate i2c with gpio in scratch and maybe you already tried this? Found your site and am very excited to try this with some kids next year. I played with Lego Mindstorms a bit, but too costly for now. Raspberry should come in a few days. Hopefully I can get it all working well. I don’t have all the parts you do (I’m VERY new to linux and all this stuff). Only thing I’ve done is program in VB a bit (simple) and play around with scratch. So no idea about most of this stuff. I was wondering If you post a parts list of your robot I would love to create one for my class to program and play around with. An electrical components list would be a great start =). I’m wondering what to buy (buying alot from ebay and takes weeks to come). I ordered a lot already. I was wondering if DC motors are as easy to control as well? Will they still use Motor A (128) or will it be different. I am thinking of buying a kit from sparkfly just to make it simple for now (contains wheels and some gear motors) might not be that fast, but I can improve it as I play around I hope. They are DC motors though. I assume I will need some kind of chip to control them. Do you know which ones? just going to get this SN754410. Seems like a way I can use different motors. I gave up buying individual bits and pieces for motor drivers, instead used Ebay! Simon, are you (we) still looking for wheels? I am working on an interesting project which is right up your street and very much in line with your great work on RPi GPIO handling through Scratch. I would really like to tell you more about it, would you mind giving me your email address or a way to privately message you in this forum so I can introduce myself ? Hi. This is fantastic – thanks for sharing. I just got the led blink working in Scratch with my Gertboard. For anyone else trying this, the pin-out on the Gertboard doesn’t match the setup in Scratch. I changed the GPIO setmode in the python script to BCM and that seems to have worked. after looking into the script a bit more. Is this correct? You can do the I2C and extensions and they will just have new ‘pin’ names. e.g. motor88 would do gpio88 (technically). But what are the new pin names if you do add more. I just thought of an idea too. If you do a mesh. You could technically just have 1 pi connected to various other things and allow students to just send broadcasts to their (pins) to play around with the idea of interfacing with the real world. of course you would need addition power. This doesen’t seem to be working for me. I kow this seems strange, but using the blink11 example the LED doesn’t blink. Why? Everything is wired properly, the LED /is/ actually connected to pin 11, but why won’t it work? Forget that, I was using the numbers normally used in Python. (Where the actual pin 11 is 17) I guess I’m just too dunderheaded to look at the diagram. I wish to understand how install_scratch_gpio2.sh is put together and how you made Scratch be able to connect to the GPIO pins. What code is there in the background to make it all work ? Hi, the installation instructions dont work, when I type sudo /boot/install_scratch_gpio2.sh on the LXTerminal I get not found or syntax error = ‘(‘ unexpected. Hi omar – your the 1st to say the intructions don’t work! Are you doing the 1st bit which downloads the install_scratch_gpio2.sh to your /boot folder – is it coming up with some sort of error? I have the same problem as prawntot. Running blink11.py from command line does just what I’d expect however using Scratch project blink11 there is no joy. I have installed Debian Wheezy 2013-05-29 then ran apt-get update, upgrade then followed the instructions from cymplecy on this page. Nothing else was done with this distro. Was able to confirm that self extracting installer did give a successful outcome in regards to terminal output ending in “finished.” About scratch indicates that it is v1.4. Any thoughts on how I could trouble shoot this further? Problem solved, I had inadvertently used 2013-05-29-wheezy-armel for a distro. Duh! Thanks for putting this together Simon. I will be hosting a workshop with some high school next week with pis and your scratch gpio in the US. Is there any way of controlling servos or motors through this without using additional hardware? HI there, is there a way of getting Scratch to send out i2c commands? I’ve got a WS2801 LED breakout board.. would like to broadcast messages out to it… can it be done? I have had my Raspberry Pi a week and really appreciate your tutorials and work. I got the blink project to work not problem. But now I wanted to turn the light on and off with a button. However, I cannot get Scratch to respond to a GPIO button press. It works in python so I think I have it wired correctly. In the presentation window I have the sensor value visible. The initial value of pin24 is 1 so no light shown. I see no change in value when the button is pressed. Below is the website where I got the code and the code. I’ve changed the code that searches for the string later on when performing the sensor-update, and with the changes (removing the ” )it works…. It appears the shlex.split also removes the “, and hence breaking the searches later on! I’m sorry but I’m stuck on the first step. I’m getting ERROR 403: FORBIDDEN when trying to download it. Anybody have any advise, many thanks. Many thanks, all sorted now, keep up the great work. I am trying to get my 8 & 12 year old grandsons into computing, as I did with my own children through the BBC micro. Firstly I would like to say a big thank you for your program for accessing the GPIO from Scratch. You have obviously put in a great deal of work and yet your patience with questions that have already been answered in the discussions, is amazing. I have learnt a great deal already from your “Introduction for beginners” and the discussions following them. I would like to say that the download and operation of the blinking LEDs worked first time for me and I am ready to try motors when I get the ULN2003 chip. I am interested to know what part 4 is about as I can’t seem to find a link to it. I have clicked on “Follow” which I hope will keep me up to date on future projects, but are there any in the past that would be helpful? It is a great pity that you are not a teacher in our village primary school! Thanks again for all your work and help for me. Nice work Simon, thanks. Your guide was very easy to follow. When downloaded the Scratch GPIO I found I did not have a suitable cable to connect the LED to gpio. Well, a old data cable from a HD drive came in my help. Then I can to see my LED blinking. Thanks again, and sorry for my limited english skills. Hi again. I want to show my first project /w blink11.sb script..
if I run as pi user or my own user. PS I foudn out today that if i double-clicked on the line of code it selects it all which I’ve found is easier than trying to select the code by click and dragging. Connecting to dl.dropbox.com (dl.dropbox.com)|23.21.174.62|:443… connected. Connecting to dl.dropboxusercontent.com (dl.dropboxusercontent.com)|54.235.131.126|:443… connected. Really want to play with my son and and I are converting a Big Trak to run on pi and I would like to use scratch for diagnostics and to program it . our rocket launcher lol we done the weapons first . Can you go into /boot and do an ls? done and the starnge thing is the file is there. I will try a fresh install tomorrow just in case becasue my webiopi has stopped working too . Will post back if it works or not. Thanks for the fast responce would not get this level of support from microsoft lol. Fresh build and it worked , need to stop messing with mine when it works lol. A bit of a problem on Occidentalis v0.2. Running “sudo python blink11.py” works just fine, but neither one method from ScratchGPIO2 (broadcast, set, pin…) turns on the LED. has the installer created /home/yourusername/simplesi_scratch_handler? Does Remote Sensors Enabled appear on the screen when you launch ScratchGPIO2? Started apt-get dist-upgrade. Will report back later. Still the “sudo python scratch_gpio_handler2.py” exits with “‘module’ object has no attribute ‘setwarnings’”. Can’t verify as I can’t VNC to desktop right now. Will post result later. Culprit was the old RPi.GPIO module (for Rev 1 board). So, if you anyone has problems with ScratchGPIO2 on Occidentalis, just check your RPi.GPIO version (http://pastebin.com/s6dvyxBi). Thanks for the work, but … it does not work. First of all, he line “sudo wget https://dl.dropbox.com …” does not work. I get the answer “no such type of file or directory”. I succeeded in downloading the file and then copying it in /boot and installed it. I got the “ScratchGPIO2” icon. The program launches, I have the example files, but nothing works. No effect on the gpio pins. When I look for the sensors, no pin is visible. I have only 9 choices, with no pin. And when I try “sudo python blink11.py”, I get “command not found”. I succeeded in making “blink11.py” work with LED blinking, but still nothing from blink11 in “scratchGPIO2”. But if I go in the directory, ScratchGPIO2 launches, but still without ink to pins. Check the version of the RPi.GPIO module you’re using. Yes, your very kind, but I allready tried “sudo apt-get install python-rpi.gpio” and got the answer : “you have the latest version”. Found your pits and I have installed the software and got it talking to my gertboard to control LEDs and a motor. Struggling with the switch inputs . Think I have got the board wired up correctly and using the correct pins in scratch, the gertboard examples state I need to set a pull up resistor in GPIO for it to work. Can I do this via scratch or would it require a modification to the python interface? I will investigate further and make sure I have not made a mistake, planning on taking my PI and the gertboard into school Friday for a code club. They have all been getting in with the scratch examples, thought I would show them how to control some hardware. I’ve not got a Gertboard myself and I think you are the first person who’s come along here with one 🙂 As default, I set 11,12,13,15,16,18,22 and 7 as outputs and all the other pins as inputs (With GPIO pull-ups enabled). If Gertboard uses any of the default output pins as inputs E.g 22 and 7, then you’d need to broadcast Config22In and broadcast Config7In (just once per session – I put them in a On Green Flag event) to get data from them. Outputs aren’t an issue because as soon as default input is used as an output then my prog will change it from input to output. Hallo, könnt ihr hier einmal schreiben , wie überhaupt die Daten vom Scratch1.4 aufgenommen werden ? Ich versuche verzweifelt eine Netzwerkverbindung mit Sratch 14.4 aufzubauen zum PC , um überhaupt mal ein Wort nach Scratch1,4 zu senden . mit IP 127.0.0.1 und Port 42001. Hi, you can write here again, as all the data from the Scratch1. 4 be included? I’m trying desperately to connect to a network with Sratch 14.4 to the PC, to ever send a Word to Scratch1, 4. with IP 127.0.0.1 and port 42001. I think the work you have done to enable control of the Pi’s GPIO though Scratch is fantastic. However, I hooked up a quick2wire interface board to my RPi so that it is easier/safer for my children to use. Do you have any plans to implement WiringPi pin numbers for the broadcast/pin patterns/variables as well as/instead of the native GPIO pin numbers? I’d never considered it before. I used to have support for the Broadcom GPIO numbering scheme but I abandoned it when the some of the physical pins changed from Rev 1 to Rev 2 boards but I am planning on adding that support back in as quite a few peripherals mark their outputs using that scheme but I’ve not seen anything that refers to wiring pi numbering. What quick2wire board are you using? It’s good to hear that you are thinking of putting the GPIO labelling scheme back in – it will make life so much simpler when controlling the inputs and outputs through this extension board. I’m getting myself confused here… It’s not the BCM numbering scheme I’m looking for, it’s a scheme that mimics the names of the pins. Hi, I’ve tried but something was wrong. blink2.py work properly and made the led to blink, but nothing happens when I try with Scratch2GPIO, I haven’t any sensor pin either. Any hint? Do you have an up to date copy of Raspian? do you get an error msg about GPIO? “There was an error connecting to Scratch! Reading https://www.raspberrypi.org/phpBB3/viewtopic.php?f=77&t=16183 I realized that pi user wasn’t the owner of “Documents/ Scratch Project directory”, My problem was solved making pi the owner of Document folder recursively. Thanks for your answer and your great work! I’ve found the problem – if you use a clean Raspbian, then the Documents/Scratch Projects folder does not exist and my installer creates them but since installer is running sudo – they are created as being owned by root. Xlib: extension “MIT-SHM” missing on display “localhost:10.0”. Scratch starts apparently OK in a Xterm window, but the blink11 script (nor anything else I try from your tests) is changing the state of any GPIO pins. I have also tried this as you describe, using lxsession to start a desktop and then starting Scratch_GPIO from the icon, but that seems to fail in the same way. Possibly I’m doing that from the wrong directory or as the wrong user? Thanks for this, a great way to get kids into programming and GPIO. I had the same problem with an older version of the GPIO that doesn’t support ‘setwarning’, but as soon as I removed the old version, following the uninstall GPIO instructions, then used apt-get install RPi.GPIO, it worked first time. I have now tested my GPIO using the wiringPi gpio test CLI program; so my problem’s not hardware but just in driving the GPIO from Python (and therefore from Scratch). Am I merely missing Python.h (my C is rusty too!) from the correct location – as suggested by the fail of gcc when I try to install RPi.GPIO? Thanks anyway. You’ve spurred me into refreshing my Linux admin skills (after too many years of having a team of techies to do that sort of thing for me ;->). I’ve built a new Raspbian and got the hang of using apt-get properly, and I now have a LED blinking happily on pin11, controlled from Scratch, so I’m ready to play with some stepper motors! if I press the switch and the value goes from 1 to 0 the program takes off .. but this does not seem to work?? Any examples or other doc would be greatly appreciated.. This is fantastic!! I have been wanting to demonstrate to my daughter how real computers control real-world stuff, and this is just the ticket for her to see for herself. Congratulations and thanks so much! One comment, one query. Comment (by no means a criticism): I set up two LEDs flashed by two sprites, one at 1 second period and the other at 2 second period. They do not stay synchronised at all. I guess that’s down to Scratch’s execution model. Query: Am I right in understanding that Scratch 2 will be entirely web-based and therefore incapable of this? I have got a method of controlling the ports from a desktop/laptop PC (look for SID in my other posts). Neil – two things – I thought I’d answered this comment a while ago but now can’t find it so sorry for that ! But this morning – I can’t get the script I was using last night to fail!!!! You have been busy since I last looked! A script that won’t reliably fail could imply that session history has come into play during your previous session – environment variables, global variables, etc.. If your session did not start with a clean slate, perhaps something was carried over from the previous script (?) When I get a chance I’ll try the same thing in Scratch (non-GPIO) and see if I observe the same timing irregularity. Thanks for a fabulous resource. This is using the python USB bindings – so not GPIO – But I will send you the modified script if you would like. Right now it is a bit of an ugly hack, but if you are interested in including it I will tidy it up before sending. I runa code club and have started taking my own PI in and getting the students controlling LEDs via scratch GPIO. I have noticed the post about the USB modification to control a Maplins robot arm which I have. Is this code available? The club has just received 3 PIs from google so next term I was thinking of using one to control the arm and the other two LEDs etc via a breadboard. Your scratch code sounds very interesting. Would it be possible to make it available for all so that we can use and modify, please? My daughter has been using your GPIO2 in her school project and got a number of sensor inputs working! Thanks to your code! She’s excited to learned you now have GPIO4 with output pins & promptly installed it on her raspberry pi. However, when she checks the ‘slider’ sensor value, the menu lists only ‘motoracount’ rather than listing all the pins … not even the input pins are showing & the program with sensors that worked on GPIO2 doesn’t work with GPIO4. Any idea what problems she might be running into? My daughter tells me she saw similar thing happened w/ GPIO2, but very intermittently & is solved by re-booting her raspberry pi … reboot does not help however with GPIO4. Any help to isolate issue is very much appreciated. It also waits to see if you have any addon board in use so it doesn’t report anything until intitially. A workaround is to simple make Green flag broadcast AllOff and then pins 22 and 7 will appear. Sorry for some reason i did not get email notification of your response. Thanks for the quick reply. My daughter left her raspberry pi at school over the weekend & she will send you the script directly when she returns to school Monday. I’ve successfully installed GPIO4 and successfully tested the output commands. How do I get access to the input pins? Great! Will try this out as soon as we return home from the Xmas holidays. I just downloaded and the pins are available. I’ll give it a test and let you know if I discover any issues. Thanks for the quick response and a great application. if that doesn’t work – can you get on github at all? I hope you remember me. We discussed at the physical computing forum of Scratch site about my mod for Raspberry Pi GPIO. I am writing a book for kids that focuses Raspberry Pi and Scratch with my friends now. Of course this book covers your Scratch GPIO! Thank you for your great work. I found some important changes in the recent version, 4.1.09. One is some input pins, e.g. pin22, are pull down now. These were pull up in version 4. Another is usable input pins are always appear in sensor menu. These were appended dynamically in version 4. I am little bit confusing about this specification changes. I understand evolution is very important. However I would like to know stable fixed specification. Where is the “original” documentation for Scratch and GPIO? I have looked but only found a different source. Not sure what it is your looking for “original”????? I mean where it tells you about “Broadcast pin12high”, “Set pin11 =100” etc. It’s where the GPIO library meets Scratch. Is there documentation for that – or is that all your invention? The original code base was from Thomas Preston’s work at Manchester University for controlling the PiFace. I don’t remember there being much documentation at that time (18 months ago) and it has pretty much changed out of all recognition since then. I “invented” much of the broadcast syntax (well me and a lot of feed back from fellow enthusiasts on twitter) and I decided on variable values going from 0 -100 and using MotorA and MotorB mapping to pins 11 and 12. I want it to be as simple as possible for 8-11 year olds (and their teachers) to use and understand. I’ll let you know. Just started working with them in schools. I’m impressed by the ability to control motors and read sensors. I’ve been using Scratch for Arduino which has similar functions. All very exciting. There’s S4a which is an actual mod of Scratch so the blocks are hard coded into it. Thank you, came across this while trying to understand how to get a PiGlow working! Congratulations and thank you for your great work on this. I have been working my way through it but I am having mixed success. I have got as far as variable speed motor control using a 2803 chip and an external power supply but I am getting nowhere with driving a stepper motor. I have some of the 28BY motors you mention and I wired one of them up as in your diagram. I set up a simple script to broadcast StepperA and then set MotorA first to 50 for 5 seconds, pause for 1 second and -50 for 5 seconds. The motor runs ok but it goes the same direction each time instead of reversing. I am using pins 11,12,13,15 on a rev2 board with 512MB, made in China. As an aside, your beginners page from which I am sending this has a problem in that the instructions are clipped on the right hand side. I have tried both Chrome and Firefox so it shouldn’t just be a browser artefact. I’ll plug a stepper into mine at the weekend and check to makes sure I’ve not introduced a bug. Thank you for your patience and help. I used the python demo program to get more familiar with what is going on and I found that I had swapped the connections to pi pins 11 & 12. I now have the motor turning happily from python. I will now try scratchgpio again with the correct wiring. Re clipping – its just a WordPress blog – looks fine with me which bit in particular is clipped? Thanks for the instant reply! Now that I look again the problem is that everything from the first instruction on how to install is in a window which doesn’t wrap but which I see can be scrolled. I was afraid I might have missed something but I see now how to access the whole lot. I’ll check out the reference you gave for the stepper, I am only too aware of how easy it is to make an error in connections and not be able to see it later. I have trouble reading a switch, I thought the internal resistors for the inputs we pulled high, so I connected pin 24 through a 1K resistor and the switch to ground. This is based on response to an earlier question. The input never changed state so I connected the other end of the switch to pin 1, 3.3 volts and it now works reliably. This makes me think the internal resistors on the inputs are set to pulled low, is that correct. I have been using scratch gpio in school as part of my code club, at the moment we are simulating traffic lights, I want to use the switch input for the “singing jelly baby” project. Cuurent stable release pulls-low. This was done as the default state of high is considered not to be “right” as normally attached boards expect low signals as initial condidtion. I wil be- re-instating default pull-high on all pins excpet 11,12,13,15,16 and 18 which will be set as outputs in V5 wit h the pull-down settings only enabled when the +Plus version is launched – they should keep it simple for beginners but satisfy the more advanced user. I can’t change V4 because someone has written a book and uses the pull-down convention so I’ll need to create a new link etc ! I can drive a stepper motor from python no problem so the connections are finally ok. I am still having no luck from scratch though. I have looked through the handler program and it seems to be using the same pins for stepperA although I can’t follow most of it. I have an led in parallel with the 2803 output from pin11 in the pi and it flickers while I am using python but stays off with scratch. I did an apt-get update and a rpi-update for other reasons recently but I reinstalled your scratchgpio4 after that just in case. Is there anything else I can try or have you had a chance to make sure it still works with a stepper motor? If you had time to post a scratch program that works showing where steppera gets broadcast and showing the speed and position variables in use it would be great. If you stick a LED on pin 11 and do broadcast pin11on – does it come on? I’m checking what is wrong with my MotorB stepper but that shouldn’t affect your situation. Success! The problem was in the original greenflag broadcast. I had “StepperA” which I think is what is in your instructions so I tried changing to “stepper” as in your example and all is working perfectly now. Thank you very much for your help on this, giving your time like this is much appreciated. You may be amused to know that the external power supply I use to drive the motors is in fact a mains adaptor/charger from a Commodore calculator I bought around 1974! Its last job was to power an electric motor built from a kit bought in the Deutsches Museum in Munich – said to be the best science museum in the world. If you need to use 2 motors – you’ll have to use the dev version until I merge the fix into the stable version. I’ve now realised that I needed to upgrade to GPIO version 4 for the revised / extended instruction set and have just done so. I’m using the same SR-04 Ultrasonic sensor as in your Introduction page 4, however I’m using two different ports rather than the one as you have. This works fine with a Python program but I cannot get the Scratch version to work. You have ‘Sonarnn’ with nn as 23 the pin number and ‘ultrann’ in your broadcast instructions but the difference between these two instructions is not clear. I can edit the pin selection in the Broadcast instruction but not the Sensor instruction and, of course, I need to have two different pin numbers rather than the same one as you have. ScratchGPIO deosn’t handle using one pin for pinging and listening on another pin. I took the desicion to use the 1 pin approach because you normally need to add some resistors anyway so you may as well configure it for 1 pin use and it makes the programming side of things easier and only uses 1 physical pin. But I could be persuaded to bring it back if there was a good reason. The difference between Sonar and Ultra is that Sonar cam first and you broadcast Sonar8 and 1 sec later – the sensor value sonar8 will be updated with the distanace found. Hi Simon. Just wondering if you can answer a puzzle for me. I use RPi.GPIO in python scripts but always need to run IDLE as root on the Pi before the scripts will run. Ive used your scratch handler quite a bit, thank you, to allow my students to write scratch programs that access the GPIO header but ive noticed they’ve never needed root privileges to do this. Ive had a look at your scratch handler and it also uses RPi.GPIO. I was just wondering how that is. Did you find a way to use RPi.GPIO without root access ? Could you help me do the same ? Its a long story but I cant give IDLE root access anymore and its hampering my students progress. Thanks for any help you might be able to give. 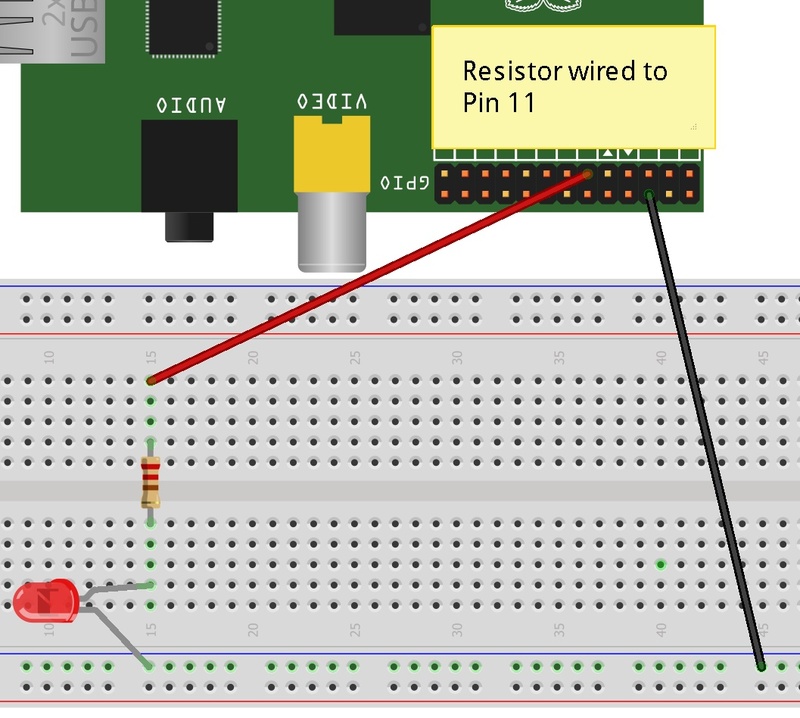 HI – Great to have GPIO from Scratch – Thanks for working this out! I have a problem installing. After bash isgh4.sh i get… (below). Any ideas? Hi – firstly thanks for putting this together – very useful. I have successfully connected a DS18B20 thermometer which I can read from either the terminal screen or from a small Python script updating the file. But how do I get this result into Scratch??? I’ve looked and looked and looked!! I think Broadcast holds the answer but not sure but how I get a result broadcast from the Python file, I have no idea and also no idea how Scratch would execute that file. Maybe there is a much easier way!! It’s the first bit of a homemade hot water solar panel system I am building. The rest will be controlling pumps and actuation valves. Hi. Nice job packaging this. It really is something that Scratch should have built in. It looks like it is when it’s installed too. Nice! I’m trying to get a PCF8591 to work. I’ve wired it on in the manner of http://blog.jacobean.net/?p=258 and I can properly run the Python code he has on that page just below the schematic. I fiddle with the voltage divider pot and see values from 0 to 255. When I go into Scratch, I see ‘adc1’ through ‘adc4’ as sensor choices, so that tells me that the chip is communicating. ALso good. If I write a little Scratch program that simply reads the value and displays it or uses it to set the rotation of the sprite, I only get one reading and that value just comes in over and over. So if I set the pot midrange, I’ll get 128 as the only reading. I can then exit out and restart with the pot in a different spot and I’ll get a different reading that doesn’t change. Is there something obvious I’m missing? Thanks! I just powered up my ADC board from @4tronik and its working fine for me sorry. I’ve also got a robot prototype with one of the chips built into it and both devices return updated values several time a second. Its a mystery – all looks like it should work – no errors and you say it works with python code???? I’ve ordered a a PCF8591 chip and I’ll wire it up like that article and see what happens at my end then – we’ll get to the bottom of this!